Water Fuel Cell - Is it possible to run a fuel cell on water? 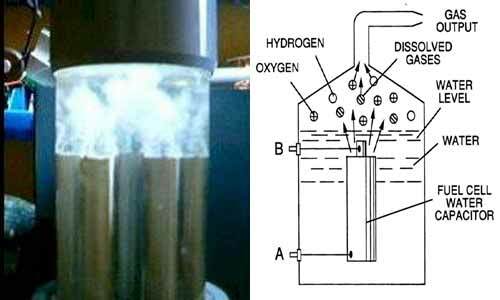 The water fuel cell is an invention by American Stanley Allen Meyer. As to whether Meyer was really able to achieve the results he claims will be eternally disputed. Meyer took key details of his invention to his death in 1998. Colleagues have been trying to replicate his work since - with nobody being able to achieve the same results. Meyer claimed that an automobile retrofitted with his device, could use ordinary water as fuel (instead of gas). Eye-witness accounts suggest that Meyers fuel cell could indeed split ordinary tap water into hydrogen and oxygen with far less energy than that required by a normal electrolytic cell. The hydrogen was then burned to generate energy to power a vehicle. The process resulted in an emission of pure water. According to Meyer, the device required less energy to perform electrolysis than the minimum energy requirement predicted by conventional science. A demonstration made before Professor Michael Laughton, Dean of Engineering at Mary College, London, Admiral Sir Anthony Griffin, and Dr Keith Hindley, a UK research chemist apparently confirmed this claim. During this demonstration, Meyer's cell produced far more hydrogen/oxygen mixture than could have been expected by simple electrolysis. In addition it was noted that normal water electrolysis requires the passage of current measured in amps, whereas Meyer's cell achieved the same effect in milliamps. Furthermore, ordinary tap water usually requires the addition of an electrolyte such as sulphuric acid to aid current conduction; Meyer's cell functions at greatest efficiency with pure water and no additives. According to the witnesses, the most amazing aspect of the Meyer cell was that it remained cold, even after hours of hydrogen production. Meyer's experiments, which he seemed to be able to perform to order, had earned him a series of US patents granted under Section 101. The granting of a patent under this section is dependent on a successful demonstration of the invention to a Patent Review Board. In a news report on an Ohio TV station, Meyer demonstrated his dune buggy which he claimed was powered by his water fuel cell. He estimated that only 22 US gallons (83 litres) of water were required to travel from Los Angeles to New York. Meyer also claimed to have replaced the spark plugs with "injectors" to spray a fine mist of water into the engine cylinders, which were subjected to an electrical resonance. The water fuel cell would split the water mist into hydrogen and oxygen gas, which would then be combusted back into water vapor in a conventional internal combustion engine to produce energy. Philip Ball, writing in academic journal, labeled Meyer's claims as pseudoscience, noting that "It's not easy to establish how Meyer's car was meant to work, except that it involved a fuel cell that was able to split water using less energy than was released by recombination of the elements. Crusaders against pseudoscience can rant and rave as much as they like, but in the end they might as well accept that the myth of water as a fuel is never going to go away." Stanley Meyer was sued by two investors in 1996, who he had sold the right to do business in water fuel cell technology. His car was to be examined by an expert witness, however Meyer made did not allow the test to proceed. According to Meyer the technology was patent pending and under investigation by the patent office, the Department of Energy and the military. The court found Meyer guilty of "gross and egregious fraud" and ordered him to repay the two investors their $25,000. Unfortunately, there is no "hard and fast" documented proof that the system does - or does not - produce enough hydrogen from water to run an engine. Stanley Meyer died suddenly on 21 March 1998 after dining at a restaurant. An autopsy report by the Franklin County, Ohio coroner concluded that Meyer had died of a cerebral aneurysm, however conspiracy theorists believe that he was poisoned to suppress the technology, and that oil companies and the United States government were involved in his death. Here is a link to a short Stanley Meyer biography. There are many systems available now which have been modeled off Meyers work. Thus far these systems are designed to produce HHO - commonly known as Brown's gas - which is injected into the fuel system to greatly increase fuel efficiency. Please read more about these water powered cars here. There are certainly two very distinct and opposing views on whether Meyer did in fact invent a commercially viable water fuel cell - I will let you draw your own conclusions!